If you live in and area of stone then you will doubtless have seen some fantastic dry stone walls marching across the landscape. 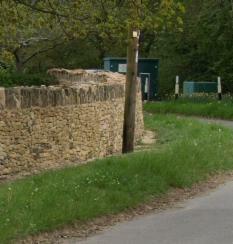 The tradition of dry stone walling stretches back centuries although many of the walls date from the late 18th century and the Enclosure Acts which created many of the field strutures we see today. 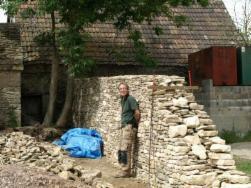 Much of my work involves working to bring older walls back to life. There is something deeply satisfying in knowing that a wall that was built 200yrs or so ago can now go on to age in good shape. The pictures below are a mixture of repairs and new walls. More details can be found in the Gallery. 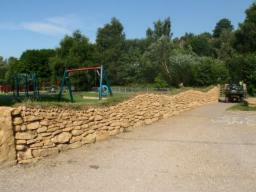 I have included a picture of a bespoke stone 'hedge' built for a playground project. These are stone faced earth banks which are then planted on top. Eventually the whole structure will look like a grass covered bank and a provide great haven for wild flowers and grasses. 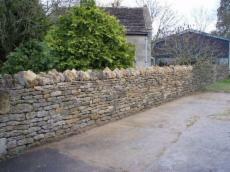 Dry stone walls have very basic ingredients; stone and perhaps a little optional lime mortar, to hold on the copes stones around areas of high wear,e.g. stiles. 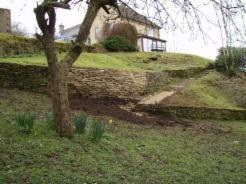 The foundations are shallow perhaps 3-4 inches and consist of larger stones carefully bedded onto the bare earth. No deep footings, no concrete just stone. Oh yes and a degree of skill, and experience to take that stone and create the wall, which is where I suppose I come in.